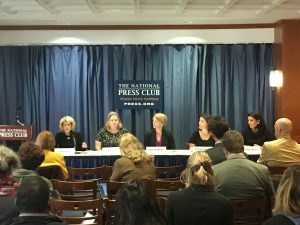 In October, Project GOAL convened a program at the National Press Club in Washington, D.C. to discuss public and private sector solutions to bridge the broadband gap for low-income older adults. 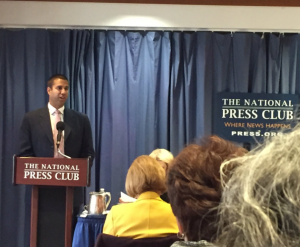 The event, “Making the Connection: Lessons Learned & Ongoing Initiatives to Bridge the Broadband Gap with Older Adults,” featured a keynote speech by FCC Commissioner Ajit Pai, and a panel of experts on the topic. Commissioner Pai opened the program with a review of his Digital Empowerment Agenda, which supports the delivery of high-speed broadband to all Americans, regardless of where they live. In rural America, the Agenda promotes the extension of digital opportunities in order to deliver broadband services to the most economically challenged areas. In order to accomplish this, the Commissioner suggests some steps include removing regulatory barriers to broadband deployment and the promotion of innovative services. Immediately following Commissioner Pai’s remarks, a panel of industry and non-profit experts spoke about the challenges of delivering low-cost broadband services to the low-income older adult community. During the panel discussion, representatives from Comcast, AT&T, Charter and the AARP Foundation spoke with Project GOAL Executive Director Debra Berlyn about the practices they have employed to best address barriers to broadband adoption. The panelists discussed how best to market broadband services to older adults, as well as how to address the all-important issue of showing this community the relevance of using the Internet. Comcast, AT&T, and Charter are three companies that have programs that offer low-income consumers high speed broadband at a low-cost. The panelists agreed that while getting the older, low-income community to adopt broadband can be challenging, the objective is important. Older individuals who have connected and have digital access realize great benefits, reduce isolation, and find improvements in many aspects of their daily life. This Project GOAL event was an opportunity to highlight some of the great programs that are currently offering low-income older adults an opportunity to receive broadband services.